IT is unfortunate that India needs to be told about its human trafficking problem by the US. And it is no consolation that the country is listed on the ‘Tier 2 Watch List’, and not in the first worst category in the “2007 Trafficking in Persons Report” released in Washington on Wednesday. THE Sri Lankan Government’s perilous plunge to extend the war against the Liberation Tigers of Tamil Eelam (LTTE) as a security offensive against all Tamils has been thwarted by the country’s supreme court. Had the court not intervened to impose a stay on the unconstitutional and discriminatory act of evicting Tamils from Colombo, the Sinhala-Tamil divide would have deepened with disastrous consequences. IT is common knowledge that God made man and it is the tailor who turned him out as a gentleman. In a world where political norms and cultural mores are for ever evolving, matters of dress have got much more complicated.The complication is both a cause and result of the abounding choices and fashions in a world where proliferation extends to all things from the nuclear to the sartorial. ANYONE in this country who claims to be surprised by an Argentine court’s decision not to extradite the redoubtable Ottavio Quattrocchi to India in connection with “Bofors kickbacks” is either a hypocrite or an ignoramus or a combination of both. ALTHOUGH consigned to the heap of their discredited past, the two Bangladesh leaders – former Prime Ministers Sheikh Hasina and Khaleda Zia – are as important today for the country as they were yesterday. Scientists have criticised a major review of the world’s remaining oil reserves, warning that the end of oil is coming sooner than governments and oil companies are prepared to admit. If the Congress were to decide its presidential candidate by popular vote within the party, AICC treasurer Motilal Vora would be in the top league. The accessible, affable leader who is perhaps the strongest link in the AICC with the older generation of Congress leaders, exudes warmth towards all the visitors. IT is unfortunate that India needs to be told about its human trafficking problem by the US. And it is no consolation that the country is listed on the ‘Tier 2 Watch List’, and not in the first worst category in the “2007 Trafficking in Persons Report” released in Washington on Wednesday. There may be substance in the speculation that it is the growing partnership with the US that prevented the State Department from portraying India in darker hues. Some may even question the US credentials to prepare such a report on human trafficking in the world. Whatever that may be, the fact is that trafficking in human beings is at its worst in the largest democracy of the world. It is not for want of legislation that the situation remains so bad. There are laws specifically to deal with trafficking in women, for instance. Similarly, there are laws that prevent employment of children in hazardous jobs. Even in trades where children can be employed, it is mandatory for the employers to provide them opportunities to study. But it is in the enforcement of these laws that the state fails. There are organised groups who specialise in trafficking in women from the villages, who often end up in brothels in the cities. The report cites one specific instance where the police did nothing when a civil society organisation rescued a large group of children who were enslaved in factories where they risked continuous exposure to harmful chemicals. Even when the police responded, it was too weak-kneed to make an impact on the factory owners. Such cases are frequently reported. Many handicapped children who are found begging on streets are victims of such traffickers. It was not long ago that a news channel exposed the involvement of an orthopaedic surgeon who made money amputating the limbs of able-bodied persons so that they could beg. Very often newspapers carry reports of the so-called philanthropic organisations exporting children for adoption. Many racketeers use the cover of travel agency to indulge in trafficking. As the report rightly points out, “the traffickers prey on the most vulnerable members of society, most often innocent women and children, exploiting, abusing and profiting from their suffering.” It is high time the state came down heavily on the traffickers who besmirch the reputation of the nation. THE Sri Lankan Government’s perilous plunge to extend the war against the Liberation Tigers of Tamil Eelam (LTTE) as a security offensive against all Tamils has been thwarted by the country’s supreme court. Had the court not intervened to impose a stay on the unconstitutional and discriminatory act of evicting Tamils from Colombo, the Sinhala-Tamil divide would have deepened with disastrous consequences. It is shocking that the government should have ventured at all in this direction: of rounding up and deporting hundreds of Tamils staying in low-rent lodges in the capital to their permanent addresses in the north and east of the island. Besides being inhuman and illegal, they betray a thoughtlessness on the part of the state that can only alienate a minority that is already besieged in more ways than one. Surely the government knows that not all Tamils even from the north and the east are terrorists or sympathisers of the LTTE. On the contrary, many who have fled the LTTE-controlled areas are refugees from the depredations of the terrorists, and many others are in Colombo for jobs and education. It is not inconceivable that some of these lodges also may be used by the LTTE, but that is no reason for a crackdown on all Tamils and treating them as enemies of the state. In fact, by doing so and deporting them, the government is only reinforcing the LTTE campaign that Tamils can be safe and secure only in a separate state. Now with the court stopping the eviction and Prime Minister Ratnasiri Wickremenayake expressing regret, the government should ensure that there is no further untoward fallout. The military campaign against the LTTE - which has met with a good measure of success - should be supported by a push towards a political solution. Unfortunately, far from doing that, the Sri Lankan government is treating all Tamils from the north and east as a security threat. Such an approach is unlikely to serve the cause of Sri Lanka’s sovereignty or the efforts to end the conflict, and, instead, only provide fresh ballast to the LTTE and the Sinhala extremist forces. IT is common knowledge that God made man and it is the tailor who turned him out as a gentleman. In a world where political norms and cultural mores are for ever evolving, matters of dress have got much more complicated.The complication is both a cause and result of the abounding choices and fashions in a world where proliferation extends to all things from the nuclear to the sartorial. It is easy for President George Bush to decide what he has to wear: a business suit. The business of America is business and so it is only fitting that the American president should at all times - at least when he is visible to the rest of the world — be outfitted in a business suit. Lesser mortals of lesser countries which are not deemed to be indispensable to the world know that they would never be at a loss as to what they should wear if they follow the trends in fashion that are set by the US. For those who cannot decide for themselves — when there is a mind-boggling range of fabrics, garments, designs and colours to choose from — the option is to just pick what suits the pocket. Those who are a little better endowed can select after seeing fashion magazines and television programmes or by simply strolling through the malls. For the truly upmarket and well-heeled there are designers and boutiques waiting to deliver exclusive services. One has to be of a still rarer distinction to actually receive direct advice from the American President in the matter of suitable attire. Such a one is General Pervez Musharraf. President Bush has had it conveyed to him that he should shed his military uniform and don a dress more suited to the climate of democracy if “he wants to continue in political life”. Lucky Mush. Imagine the US Prez taking an interest in what you wear — or don’t wear. Only some envious neighbours would sneer at this saying that the General needs advice even on what he has to wear forgetting that democracy in Pakistan could certainly do with a dress rehearsal. ANYONE in this country who claims to be surprised by an Argentine court’s decision not to extradite the redoubtable Ottavio Quattrocchi to India in connection with “Bofors kickbacks” is either a hypocrite or an ignoramus or a combination of both. For, how can the judiciary in a foreign land take seriously charges that the Delhi High Court rejected in 2004, without any higher authority having overruled that verdict so far? Even this pales, however, compared with Mr Q’s enormous clout that was put on international display only a few months ago. A senior law officer of the Union government had travelled to London to tell the Crown Prosecution Service of Britain that since there was “no case” against Quattrocchi, there was no reason for freezing any further one of his London bank accounts. Ironically, this happened even though the CBI, acting under the direction of the Supreme Court, was taking a contrary position. No wonder, it transpired later that the law officer visiting London did his job while keeping the premier investigating agency in the dark. More intriguingly, the e-mailed official version of the Indo-British consultations in London — as a result of which the British courts unfroze Quattrocchi’s account worth millions of dollars — reached the top brass of the CBI only after Mr Q had happily withdrawn the unfrozen millions. Despite widespread protests, the Congress-dominated government pretended that it had nothing to do with the curious episode. Of course, it is open to the CBI to appeal to the Argentine Supreme Court against the judgment that has not only let the resourceful Mr Q off the hook but also ordered the prosecution to pay Quattrocchi’s legal fees and made the CBI the target of some of its barbed comments. Mr Q has expectedly given expression to his unrestrained glee. Under the circumstances, the question is whether any useful purpose would be served by any appeal to the Argentine apex court. Wouldn’t Quattrocchi gain more brownie points before leaving Argentina as merrily as he had left Malaysia some years ago after Malaysian courts, too, had rejected the Indian request that he be extradited to face Indian justice? At that time, the BJP-headed National Democratic Alliance was in power in Delhi. The point to note is that 20 years have passed since the charges of Bofors bribery had first erupted. During this long period five different governments have come and gone but nothing worthwhile has happened despite the most elaborate legal proceedings, intense media investigations and the Opposition’s constant complaints of a “cover up”. Most of the other “accused” cited by the CBI, including the former Prime Minister, Rajiv Gandhi, died long ago. Only Quattrocchi remains, and he is targeted by the critics of the Gandhi family and the Congress for the simple reason that during Rajiv’s time he had become a very big shot in Delhi. The one fact that generates great emotion still is that Quattrocchi got a lavish payment from the owners of Bofors though no one can explain why. This is the contemporary picture reflecting Indian reality. Interestingly, it coincides with a diametrically opposed drama that is being enacted in Britain on exactly the same subject of apparently unending corruption in arms deals almost everywhere. Recently, The Guardian and the BBC relentlessly “exposed” that during the heyday of Margaret Thatcher as the Conservative Prime Minister, London had paid colossal sums of money to the highly powerful Prince Bandar bin Sultan of Saudi Arabia to “facilitate” humongous sales of British weapons systems to the oil -rich kingdom. The Labour Prime Minister of that country, Tony Blair, himself on the verge of departure, has advised his people, however, to close the issue. All defence deals, he argues, are “sensitive” and should be left alone. To reopen old transactions, involving Saudi Arabia and Prince Bandar, currently the head of his country’s national security establishment, would both “complicate” relations with Saudi Arabia and “impede” the war on terrorism. Come to think of it, there have been several startling changes of heart about Bofors in this country, too. V. P. Singh, unquestionably the biggest political beneficiary of the Bofors scandal, as the rallying point of the anti-corruption campaign against Rajiv, used to promise to unveil the “real recipients of the Bofors bribes within 15 days”. He couldn’t do so even in 11 months as Prime Minister. But he did start legal proceedings that have degenerated into endless and fruitless litigation. Earlier this year, on the eve of the assembly elections in Uttar Pradesh V.P. changed his stance 180 degrees. He suddenly proclaimed that Rajiv was blamed for Bofors “needlessly and unfairly”. Nor is he the only one to be so contrite about his past behaviour. The lawyer-politician Ram Jethmalani, a principal tormentor of Rajiv, is equally full of remorse. There has been another, wider and impersonal corrective to national thinking on the subject of Bofors. It flowed from the 1999 Kargil War. To the Indian mind it is almost axiomatic that if bribes have been taken to import a weapon, it must be useless. This exactly was the propaganda against the Bofors gun, too. But in the fighting at bleak heights during the summer of 1999, the gun gave such a splendid display of its might that the country marvelled. It also discovered to its dismay that at the height of fighting it could not import ammunition from the Swedish firm that had been “blacklisted”. Necessary imports were made at four times the normal price. This buttresses my main point that whatever might happen in Britain and other democracies, this country’s attitude towards Bofors (and other similar issues) would not change. Much more than moral indignation, the Indian political culture is briskly at work here. Its basic tenets are that whenever charges of corruption against anyone in authority are made, they must be believed. Even more importantly, insanely adversarial politics and unremitting vendetta against one’s opponents have become articles of faith in the Indian political system. No sooner does a government fall than the succeeding one starts acting against the predecessors vindictively and vengefully. Look at what Mayawati is doing in UP or is happening to the ex-media adviser to former Punjab Chief Minister Amarinder Singh. Thus, it is that while Quattrocchi is most unlikely to come to grief, court cases against him would not cease. Like that of Banqo, the ghost of Bofors just would not go away. Ramu, as he was universally called, was a brilliant man who contributed to whatever discussion was taking place by bringing to it his vast repertoire of wit and wisdom. His journey to philosophy had begun via physics, and it took him from St Stephen’s College to Oxford. He also taught at Princeton University and various universities in India, including Panjab University and Hyderabad University, where he founded the Philosophy Department. A slim volume on A N Whitehead was enshrined in our college library. We were told it was the best work on the British mathematician, logician and philosopher well known for his work in mathematical logic and the philosophy of science. No one who read the book questioned this assertion. Ramachandra Gandhi was a grandson of Mahatma Gandhi and C. Rajagopalachari, but he carried his lineage lightly. The last time I met Ramu was to interview him for his book, “Munniya’s Light”. The novel is a story of how a 58-year-old professor of philosophy meets Ananya, daughter of a friend, a 22-year-old Indian graduate student in America, with whom he would be flying back to India. The girl child is the focus — she is the “unexcellable portrait of Atman”. The professor loves Ananya, in not quite an avuncular way, now. However, he has also helped her evolve into a thinking individual and thus she shows her care and affection while steering clear of his desire to possess her. “Did Munniya not have more than a passing resemblance to a certain student of philosophy?,” I asked him. “I never thought of it, but yes, she does,” was the answer. The interview was finished soon, but the discussion continued even as we left India International Centre, Delhi’s intellectual watering hole, and went to the adjoining Lodhi Garden, for a photography session. He posed for me unselfconsciously, quite at ease with the camera. He stuck a particular pose, crossing his arms, for a “masculine look”. The posture took me back to the college days when he had taken me aside at the end of a Philo-Soc meeting during which I had become a bit acrimonious. “You did win the point during the discussion, but by scoring the point, you lost a chance to convert him to your point of view,” he said. Ramu, who passed away at 70 on Wednesday, had not taught me formally, but he was a guru for me as also for so many others. There is, however, one difference. Then they drew power from the office they occupied, either as Prime Minister or opposition leader. Today, their strength is because of the political parties they head: the Awami League by Sheikh Hasina and the Bangladesh Nationalist Party (BNP) by Khaleda Zia. Unfortunately, they have reduced their respective parties to their personal fiefdoms, with no internal democracy, no accountability. Since they do not think they are answerable to anybody, no amount of exposure of their corruption and that of their relatives and associates has made them to quit. It is, however, unfair to paint Hasina and Khaleda with the same brush. However wanting, Hasina has a long record of sacrifices and sufferings. Her father, Sheikh Mujib-ur Rahman, founded the Awami League, which had deep roots. The party is intertwined with the country’s liberation struggle and its culmination. But then, Hasina is not the party. She has, in fact, pulled it down from the pre-eminent position it enjoyed. On the other hand, Khaleda’s BNP, was started by her husband General Zua-ul Rahman who, no doubt, was part of the liberation struggle but is said to have flinched when it came to saving the Sheikh from assassination. Khaleda never stirred out of cantonment and, therefore, the BNP never reached the grassroots. Her sons, as their acts of corruption reveal, used the party for their own ends. What surprises me is that even the top functionaries in the two parties have continued to play to the tune of the two ladies. Members in each party are so afraid that they dare not question their leaders as long as they are present. Even the stalwarts feel that their party will not go far without them. The army, which is behind the caretaker government, is said to have hinted to both to leave the country and stay out until after the elections, which are scheduled to be held at the end of next year. Hasina is a hard nut to crack. She or, for that matter, the Awami League, has support in every hamlet in Bangladesh. It is the Indian National Congress of the old days. 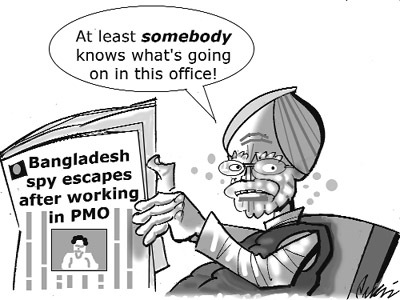 Yet, the serious instances of corruption involving Hasina and her close relations may make her ask for a reprieve. The government is waiting for that moment. At one time, it appeared as if she had decided to stay in America with her daughter for some years. But then the smell of elections brought her back. The manner in which she was restrained in London from traveling to Dhaka and ultimately allowed to return home revived her image in the media, much to the embarrassment of the caretaker government. Probably, Hasina could have been handled better. She could have been given a choice, either to face the numerous charges of corruption against her and her family or agreed to quit politics for some years. Murmurs in her party have begun to be heard. A few days ago, two or three party stalwarts told her on her face to go while the going was good. It is reported that she is considering the option of going to America this July. If Hasina does not quit – Khaleda has ceased to matter much – there is a possibility of a third force emerging. It may be a long, uncertain haul. But there may be no other option. Mohammed Yunus, the Nobel Prize winner, was a better bet. He would have attracted liberal elements from the Awami League, the Left and the intellectuals to present a viable alternative. But he was too quick to throw his hat in the ring and too quick to withdraw, leaving his admirers and supporters high and dry. Clean and intelligent Kamal Hussain is emerging as an alternative. He was the first Bangladesh foreign minister. He was close to the Sheikh. Kamal’s long tenure and popularity in the Awami League was cut short by Hasina who suspected him of challenging her. His fault was that he was insistent on introducing internal democracy in the party. What goes against him is that he has not soiled his hands at the grassroots politics. Kamal knows he will need to do that if Hasina remained in command. The Awami League may rally around him in her absence. The opposition to him may come from the party’s second rung of leadership. But since it does not have a clean record, it has no credentials to fight against Kamal. The third rung of the Awami League leadership is idealistic but raw. Kamal, who has stayed in public life without making compromises, may attract this rung. If this happens, it would be a good development for the country. Much will depend on Hasina’s decision to quit. If she does not, it looks as if Kamal is determined not to let the present opportunity go waste. He may forge a front of such parties and intellectuals who believe in running the country on principles and who want to break away from personal and power politics in which Bangladesh has remained stuck. The army may accept the third force because it would have the satisfaction of not leaving the country to those who had dirtied the Bangladesh waters. Still the people would have to make the choice between the third force and the recalcitrant Awami League at the time of election. One only hopes that people will make the right choice. British Petroleum’s (BP) Statistical Review of World Energy, published this week, appears to show that the world still has enough “proven” reserves to provide 40 years of consumption at current rates. The assessment, based on officially reported figures, has once again pushed back the estimate of when the world will run dry. However, scientists led by the London-based ‘Oil Depletion Analysis Centre’, say that global production of oil is set to peak in the next four years before entering a steepening decline which will have massive consequences for the world economy and the way that we live our lives. According to this “peak oil” theory our consumption of oil will catch, then outstrip our discovery of new reserves and we will begin to deplete known reserves. Speaking from his home in Ireland, the retired geologist and head of the depletion centre, Colin Campbell explains that the peak of regular conventional oil – the cheap and easy to extract stuff – has already come and gone in 2005. Even when you factor in the more difficult and expensive to extract heavy oil, deep sea reserves, polar regions and liquid taken from gas, the peak will come as soon as 2011, according to his analysis. Dr Campbell, an oil industry man with a CV including stints as chief geologist and vice president at a string of oil majors including BP, Shell, Fina, ChevronTexaco and Exxon, has led oil exploration on three continents. This scenario is flatly denied by BP, whose chief economist Peter Davies has dismissed the arguments of “peak oil” theorists. “We don’t believe there is an absolute resource constraint. When peak oil comes, it is just as likely to come from consumption peaking, perhaps because of climate change policies as from production peaking.” In recent years the once considerable gap between demand and supply has narrowed. Last year that gap all but disappeared. The consequences of a shortfall would be immense. If consumption begins to exceed production by even the smallest amount, the price of oil could soar above $100 a barrel. The knock on effect of such a rise would likely be a global recession echoing the great depression. Jeremy Leggert, like Campbell, is a former geologist, turned conservationist whose book Half Gone: Oil, Gas, Hot Air and the Global Energy Crisis brought “peak oil” theory to a wider audience. He compares the reluctance of industry and government figures to face up to the impending end of oil, to climate change denial. One thing most oil analysts agree on is that depletion of oil fields follows a predictable bell curve. This has not changed since the Shell geologist M. King Hubbert made a mathematical model in 1956 to predict what would happen to US petroleum production. The “Hubbert Curve” he produced shows that at the beginning production from any oil field rises sharply, then reaches a plateau before falling into a terminal decline. His prediction that US production would peak in 1969 was ridiculed by those who knew it could keep increasing indefinitely. In the event it peaked in 1970 and has been in decline ever since. In the 1970s Chris Skrebowski was a long-term planner for BP. Today he edits the Petroleum Review and is one of a growing number of industry insiders converting to peak theory. “I was extremely skeptical to start with,” he now admits. But he decided to make a survey of the biggest oil discoveries set to come online, the so-called mega projects. What he found was that production would peak as soon as 2011. What no one, not even BP, disagrees with is that demand is surging. The rapid expansion of China and India’s economy matched with the developed world’s total dependence on oil, mean that a lot more oil will have to come from somewhere. Two-thirds of the world’s oil reserves lie in the Middle East and increasing demand will have to be met with massive increases in supply from this region. The Middle East reserves have been off limits to Western auditors since the nationalisations of the 1970s. BP’s Statistical Review is the most widely used estimate of world oil reserves but as Campbell points out it is only a summary of estimates supplied by governments and oil companies. These reports are highly political and should not be taken at face value. If the Congress were to decide its presidential candidate by popular vote within the party, AICC treasurer Motilal Vora would be in the top league. The accessible, affable leader who is perhaps the strongest link in the AICC with the older generation of Congress leaders, exudes warmth towards all the visitors. Sitting for long hours in the AICC office, Vora helps hundreds of people who approach the party with the hope of getting relief from their problems. Not one to keep files pending, Vora has admirers across the Congress heirarchy. Though amused by the caution he takes in not divulging information, mediapersons too find him courteous and welcoming. Vora is among the few leaders in the Congress who hardly has any critics. Delhi based journalist Shivnath Jha has put his thirty-three year long acquaintance with Railway Minister and Rashtriya Janata Dal President Lalu Prasad to good use by authoring a 260-page book, Lalu Prasad: India’s miracle. The book, sans any controversies, holds up a mirror to Lalu’s struggles, his poor background, and the resistance from his bride-to-be Rabri to marry a man without any land or wealth. The author who shares his alma mater, Bihar National College, with Lalu, first met the rustic leader in 1974-75 during the JP movement. The writer was then working as a newspaper hawker. The meetings continued as Lalu often visited the office of the Indian Nation, a well known daily (now defunct) from Bihar, where Jha worked as a copy holder. Meanwhile, Lalu loyalists used the recent meeting of the Rashtriya Janata Dal National Executive as an excercise in sycophancy. The Executive went out of its way to pass a resolution titled “Achievements of the Railway Ministry”. While felicitating the Railway Minister for his “historic achievements”, the resolution stated that the turnaround of the Railways had attracted the attention of management students in different corners of the world. June is lesbian, gay, bisexual and transgender ‘Pride month’ in the United States, and the New Delhi American Center and Library, celebrating 60 years of its presence in India, has listed for screening four films based on the theme of alternate sexuality. The films will be screened every Saturday as part of a recent initiative, named “Saturday Cinema”. All the four films – Brokeback Mountain, Far From Heaven, Boys Don’t Cry and Kissing Jessica Stein – have been made by private producers. While the film Brokeback Mountain scheduled for screening this Saturday is about a forbidden elationship between two coyboys and their lives over the years, the last in the series, Kissing Jessica Stein, revolves around the story of a successful woman journalist who develops an intense friendship with another career woman. It remains to be seen whether these unticketed screenings would attract a big audience.